Sigma 15mm f2.8 EX DG Fisheye Lens - Canon Fit is a full-frame fisheye auto focus lens that fills the entire 35mm negative with a full 180 degree diagonal field of view. This unique lens enables you to create a variety of unusual compositions even when shooting ordinary subjects. The improved DG lens coating reduces flare and ghosting, which is a common problem of digital cameras, and also creates an optimum colour balance. Since most Digital SLR cameras use a smaller image sensor size (APS-C) than 35mm film cameras, 180 degree angle-of-view can not be obtained with Digital SLR cameras. With those cameras only the center part of the frame is used, therefore, peripheral distortion will be very small. 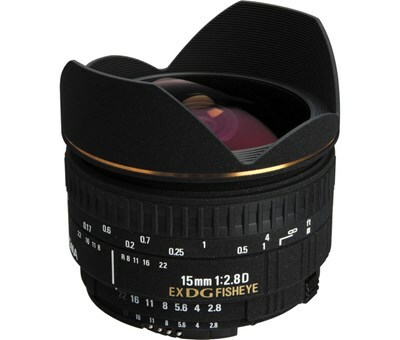 The super wide angle of this lens makes it ideal for use with digital SLR cameras, providing a focal view of approximately 23mm.